The merger of Wisconsin’s two oldest and most-respected nonpartisan policy research groups creates a new organization with broader research capabilities and an enhanced communications platform. The mission, however, remains the same: to provide expert, nonpartisan policy analysis that informs Wisconsin citizens and helps decisionmakers tackle their policy challenges. At the stroke of midnight on December 31, a long chapter in the Wisconsin Taxpayers Alliance’s 85-year history came to a close, and a new one commenced. On that date, with the retirement of President Todd Berry, WISTAX formally merged with the Milwaukee-based Public Policy Forum (PPF). The merger creates the Wisconsin Policy Forum (WPF), a statewide policy research organization with o ces in Madison and Milwaukee and an expanded 12-person staff. Who and what was PPF? Like WISTAX, PPF was a small, nonpartisan policy research organization with a rich tradition and widespread credibility among policymakers, thought leaders, and citizens. Created by prominent Milwaukee business leaders in 1913, its original mission was to promote principles of e ciency in city government. Over the years, that mission expanded to focus on research and analysis of a wide range of public policy issues facing local governments and school districts throughout southeast Wisconsin. This concentration on local government and metro Milwaukee distinguished PPF from WISTAX, whose focus was statewide and included state government. 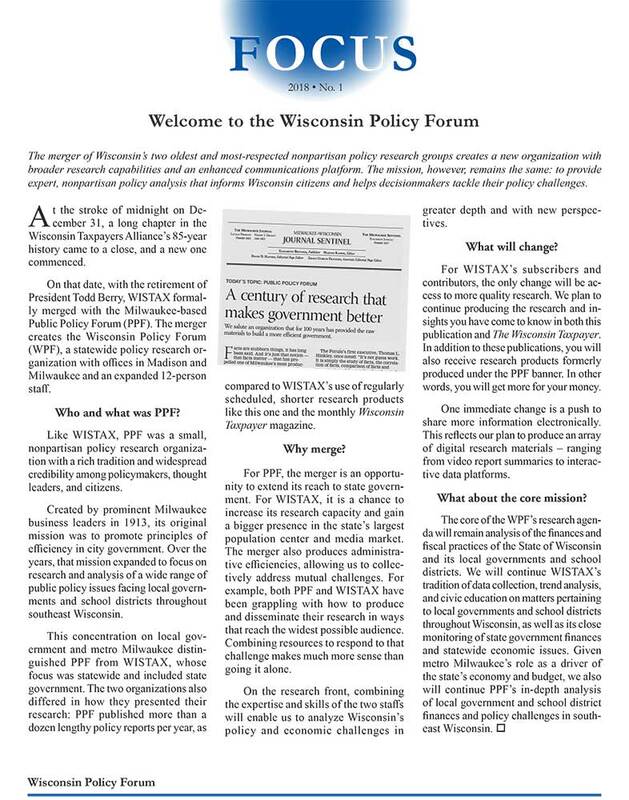 The two organizations also differed in how they presented their research: PPF published more than a dozen lengthy policy reports per year, as compared to WISTAX’s use of regularly scheduled, shorter research products like this one and the monthly Wisconsin Taxpayer magazine. For PPF, the merger is an opportunity to extend its reach to state government. For WISTAX, it is a chance to increase its research capacity and gain a bigger presence in the state’s largest population center and media market. The merger also produces administrative e ciencies, allowing us to collectively address mutual challenges. For example, both PPF and WISTAX have been grappling with how to produce and disseminate their research in ways that reach the widest possible audience. Combining resources to respond to that challenge makes much more sense than going it alone. On the research front, combining the expertise and skills of the two staffs will enable us to analyze Wisconsin’s policy and economic challenges in greater depth and with new perspectives. For WISTAX’s subscribers and contributors, the only change will be access to more quality research. 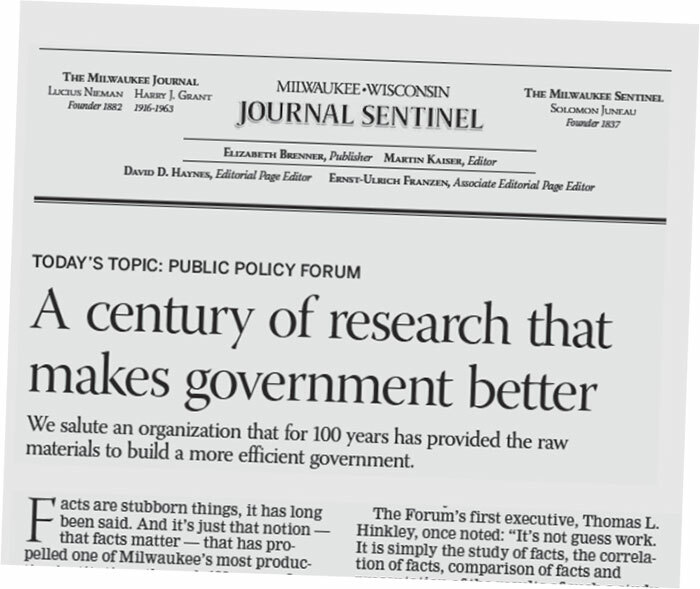 We plan to continue producing the research and insights you have come to know in both this publication and The Wisconsin Taxpayer. In addition to these publications, you will also receive research products formerly produced under the PPF banner. In other words, you will get more for your money. One immediate change is a push to share more information electronically. This reflects our plan to produce an array of digital research materials — ranging from video report summaries to interactive data platforms. What about the core mission? The core of the WPF’s research agenda will remain analysis of the finances and fiscal practices of the State of Wisconsin and its local governments and school districts. We will continue WISTAX’s tradition of data collection, trend analysis, and civic education on matters pertaining to local governments and school districts throughout Wisconsin, as well as its close monitoring of state government finances and statewide economic issues. Given metro Milwaukee’s role as a driver of the state’s economy and budget, we also will continue PPF’s in-depth analysis of local government and school district finances and policy challenges in southeast Wisconsin. It’s an honor to be taking the helm of the Wisconsin Policy Forum! While no one can fill the shoes of Todd Berry, I’m con dent that my 10 years as PPF President and 17 years in government provide me the skills to take us to new heights. Fiscal policy has long been a passion, dating back to my days as a young Capitol Hill aide to a member of the House Appropriations Committee; I was fortunate to handle his committee work. I also have extensive local government nance experience, including a stint as Director of Administration for Milwaukee County. As President of PPF, I work with a talented team of researchers to improve policymaking in our region. We have already begun to successfully blend that team with Dale Knapp and the skilled WISTAX staff. As immediate past president of the Governmental Research Association–the national organization of entities like ours–I have interacted with national peers who have provided many great ideas on how to improve our product and make it more meaningful. I look forward to meeting WISTAX stakeholders and showing you that the quality you’ve come to expect from WISTAX won’t be diminished. In the meantime, feel free to contact me at: rhenken@wispolicyforum.org. Update your account and follow us on social media! The Wisconsin Policy Forum has ambitious plans to provide cutting-edge research products and policy communi- cations using various means of digital, video, and audio media, as well as traditional printed materials. Help us update your account by providing us with your email address. You’ll begin receiving emails about new research; invitations to policy discussions and special events; and other special com- munications. Your mailing preferences won’t change unless you want them to–if you’ve received Focus or any of our other publications via postal mail, that won’t change this year. Also, we encourage you to follow us on Facebook and Twitter. We use social media to announce the release of new research, share media coverage and presentations, announce new events, and disseminate new blog posts or video report summaries. We’re excited to share the full array of WPF products and activi- ties, and we hope you will seek access to them right away!